In our secular age, the practice has faded but still survives in both Houses of Parliament and in the Sunday services of many churches. As we approach one of the most momentous votes in our history which is expected to “put Parliament in control”, the case for reviving widespread national prayers for the institution and its MPs looks strong. For the probability is that the results from the division lobbies on Tuesday night will lead to a series of political, constitutional and electoral crises which will be resolved not by the Government, nor by any one political party, but by the collective will of the House of Commons. This is a new constitutional development in which all bets are off, the whips are impotent and the power of the Cabinet and Prime Minister will be diminished. Instead the votes and speeches of individual MPs will carry an importance unequalled since the Parliaments in the time of Oliver Cromwell and King Charles I. Those protagonists did a lot of praying. How should we now pray? God is neither a Remainer or a Leaver. A Deity for whom “a thousand ages in thy sight is like an evening gone” is unlikely to be impressed by our forty years of EU Membership or by the two year transitional period that follows it. Hot topics in this weeks’ debates such as backstops, customs unions, trade deals and second referendums fall firmly into the category of “the things that are Caesar’s”. So will prayers for this or that faction. How then should we approach God with prayer requests that are spiritually relevant to the present crisis? A good starting point would be to pray for wisdom, discernment, judgement and the character of our MPs. We might usefully revive the historic Prayer for Parliament which urges MPs to “lay aside all private interests, prejudices and partial affections” and to strive for “the public welfare, peace and tranquillity of the realm and for the uniting and knitting together of the hearts of all persons”. The prayer was said daily by The Speaker’s Chaplain before every sitting of the House of Commons from 1661 until 1997 when its beautiful language was deemed to be too old fashioned for “Cool Britannia” modernists. Linguistic arguments aside, the present excellent Speaker’s Chaplain Rose Hudson-Wilkin says that many extra prayers are currently being said within the Palace of Westminster “for those facing agonising decisions”. She points out that the daily prayers she leads in the Chamber are attended by well over 500 MPs each week. Some of them come in just to bag seats for Prime Minister’s Questions but others tell their chaplain how much they appreciate a daily time of quiet spirituality. 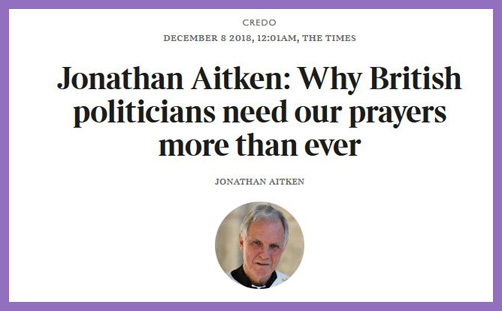 The same spirit of prayerfulness is apparent in the three weekly communion services held in the Crypt Chapel; at a monthly prayer breakfast at Speaker’s House; at Christian Fellowship meetings organised by all the major parties; and by the ecumenical Christians in Parliament group. Many MPs will no doubt use these opportunities to pray for spiritual guidance. Beyond Westminster, the Church of England, as the nations established church, still uses Cranmer’s Book of Common Prayer (1662) to pray regularly for “The High Court of Parliament”. Catholic masses often use their bidding prayers for similar intercessions, as do many independent churches. Surprisingly British Muslims, despite their unfamiliarity with Parliaments in their countries of origin, also use prayers that are relevant to the present crisis. Working as I do in a multifaith prison chaplaincy at HMP Pentonville, I asked my two senior Imam colleagues whether their congregations would be now praying for our leaders and legislators. Both Imams immediately cited the alahum aslih woolati oomorina prayer which is a verse of the Koran for “those who are in charge of our affairs”. At the Friday prayers in the mosque inside our prison, the Senior Muslim Chaplain Imam Tayeb Ali (a renowned Islamic scholar) yesterday used this prayer with Members of Parliament in mind adding “May God give them peace and guide them to the right path”. So the power of prayer knows no limits. The thought of prisoners of HMP Pentonville interceding for the prisoners of HMP Parliament conjures up an idea from a Papal conclave. Why not lock away our MPs and pray hard for them until a puff of white smoke announces: Habemus Brexitam Dealam!